KOBE, Japan - April 15, 2017 - PRLog -- The ice and snow are gone. Warmer breezes are beginning to blow. The sunshine stays longer every day. The afternoon skies now appear more often blue than gray. It's no joke; Spring has finally come. But is your mind still stuck in a cold, gray winter, held there by the everyday stresses of your life? It's Easter; time to let spring come warm up your mind! "Here's a very simple self-hypnosis against stress anyone can do," explains Professor Jay Tee. "It's not as fun as a full hypnosis session, but it will help many people to learn to relax. And it's got a fun Easter egg theme, too!" "Sit or lie down comfortably somewhere that you can both read these words and follow the instructions. After the first time, you can just remember it; but it's important to relax and read simultaneously the first time you do it." "Comfortable? Great. Now just pay attention to your breathing for a minute. Notice that each time you breathe in, your body tenses slightly. Each time you breathe out, your body automatically becomes more relaxed. Just take five or ten slow, deep breaths at your own speed, now, and feel how much your body relaxes at each exhale." "Now that you feel the relaxation, realize that you are the controller; your mind is under your control and your body does what your mind says to do. Suggest yourself to relax even deeper with each exhale, and allow yourself to relax down more deeply for a few breaths." "Now the imagination is important in the process of hypnosis, and you're got a good imagination, do you not? Imagine you are standing on a wide, grassy field, with a beautiful blue sky above. There is a warm breeze, not too hot, not too cold, lightly tickling its way across your skin. There are some beautiful songbirds filling the air with their music and flickering across the sky from time to time." 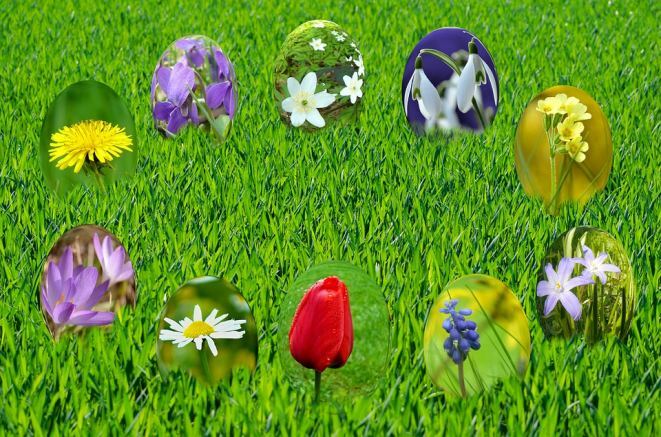 "Directly in front of you, scattered widely across the ground, half-hidden behind clumps of grass here and there, you see hundreds of brightly-colored plastic Easter eggs. You feel laughter rising in you as you realize that you have become a child again, and that this is the beginning of the Easter egg hunt!" "Although you still seem to be alone, you feel the presence of the many thousands of other children hunting Easter eggs around the world. Allow yourself to feel their happiness, the excitement, their satisfaction as they find and open each egg. Running forward, find and open your own eggs." "Each Easter egg you open gives you a powerful burst of happiness and relaxation that flows down like glowing energy through your body as you lie there. Each egg allows you to feel better and happier than ever before. Each egg makes you feel more relaxed and wonderful. Enjoy opening Easter eggs as long as you like." "Once you've opened enough, bring your awareness back to your body, and notice how good you feel! Your energy has increased, yet your relaxation is still profound. Your mind can do amazing things, when you let it do so! You find you're now wide awake and ready to move on to an outstanding day in your terrific life."